For comic book fans, one of the biggest bads of them all is the dreaded Dr. Doom. He’s a villainous star of Marvel Comics and, for the super-hero set, it’s always trouble when he shows up. Not only is he a technical genius rivaled only by the Fantastic Four’s leader, Mr. Fantastic, he’s also the ruler of his own Luxembourg-sized country in Europe. To ice the cake, he’s a master sorcerer too. Now even for Dr. Doom, that’s a little over the top, and far from becoming for a head of state. 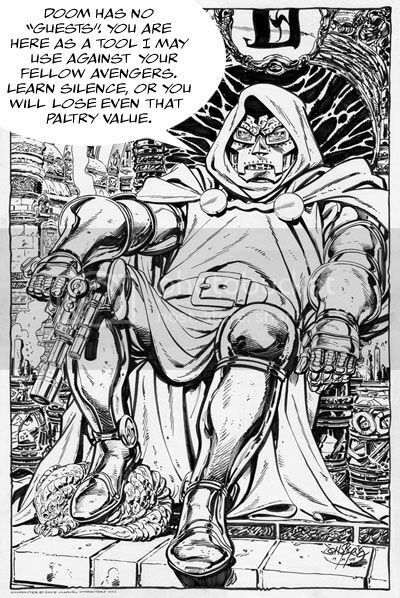 Needless to say, fans — and even some comic pros — have called Marvel Comics to task for Doom’s outburst. Veteran artist and writer John Byrne, who featured Doom several times in his amazing run on Fantastic Four, offered up how he would have done the panel, complete with totally new art and dialogue. Now that’s a classy way to tell a woman she’s not worth anything. At the very least, it’s how Doom would really do it. But the Internet, being what it is, has given plenty of others a chance to jump on the band wagon against the vile doctor’s tirade. The “When Will the Hurting Stop” blog “scored” an interview with the dictator, wherein Dr. Doom engages in an effort at spin control, blaming his foul mouth on being hypoglycemic. But the best bit so far? 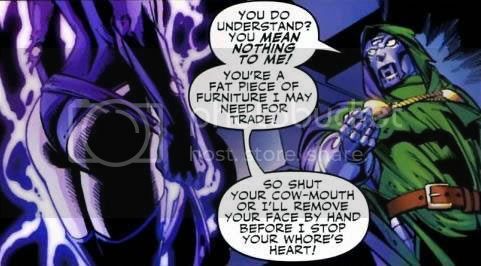 The blog “Comics Oughta Be Fun” reworded the panel to remind us of 10 other things Dr. Doom wouldn’t say. In all, its a one-panel version of the Hitler Downfall videos, and just as much fun. And who can forget this 1980s hit?